The Genocide of Jews by Hitler, and Persians of Iran is a thing of past. What we see as of today is reflection of what has been happening till now in the past. Some radical groups in Africa claiming to abduct small school girls and selling them as slaves is just a reflection of the past atrocities that has actually happened during downfall of Persia and which we are witnessing now as sort of trailer from the past. For they believe that Western culture, and education are image of materialism which is the root cause of all evil. This may be true up to a certain extent but terrorizing the innocent folks abducting them and making women their slaves and selling them off for a paltry amount is going to extreme. That is why they are called extremists. To put matters in right perspective the western civilization though they may have made genuine effort in understanding the world’s great revealed religions like Hinduism, Zoroastrianism and Islam, have made a mess of the translations of their Holy Scriptures and are unable to grasp the true essence of the mysticism behind every revealed religions of the world. The Irony of it is that they have not been able to understand their own religion of Christianity and Mysticism in it, doubting even the authenticity of Bible itself. Even doubting their own and other Prophets as mere historic philosopher or a herdsman or shepherd influencing the public with their own philosophy. If we want real peace of mind being harmonious with nature, we have to look at every aspect of life with balance. Too much of anything is bad. Even a Nectar like Honey in high doses becomes a poison for us. Similarly a dose of Snake poison if used judiciously in form of Homeopathic prescription for example “Naja”, or Mercury has cure for so many of our maladies. Hence a person with too much Faith without tolerance, one becomes a Fanatics, similarly one with no faith at all becomes Agnostic or a non-believer. One extreme end is called as “Aivibud”, the other extreme end is called as “Frebud” but the in-between path is called as “Putman” – the “Balance”. With Balance everything becomes clear to us and we find peace. One who has achieved mastery on his self when he treads on life path when he sees on one side garbage and on other side garden of roses, does not get disturbed by obnoxious smell of Garbage but remains cool, calm and collected. This calmness he achieves from knowledge lying dormant within him which he has acquired through Ashoi. That knowledge is that each one is progressing at his own speed and level of understanding and we all will finally reach the goal of perfection one day. No denying about that, and we all are governed by immutable law of Keshash and escaping from our “keshash” is likened to a camel passing through an eye of a needle which is an impossibility. Nobody can escape from it. Not even the highly evolved souls like Magav saheb will intervene in Keshash of others. What we take with us from here is only “Neki”, and material wealth is of no use up there, and the rest we have to return it back with interest. All our past “Neki” is stored in our first Chakra which we have to preserve it by covering our head all the time and which remains in jurisdiction of Sarosh Yazad. This achieved mastery over self is known as Path of “Saheb-e-Dilan” or Master of Dil our own consciousness. That is why it is said “Neki Kar Darya me Dal”. Don’t expect any reward for it, just do it and forget about it and you will get reward when we are eligible for it, in its own time and place. That is why in Bhagvad Gita Krishna advices to Arjun not to expect for reward just do your duty or Dharma without any expectations. That is why we see as to why a person who is not leading life as prescribed by our prophet is rewarded by nature. The answer to that is very simple and that is he is receiving fruits of his past actions. The reward or punishment of present action he will get it at its own time and place. What has to happen will happen anyway as per Plan of Ahunavar, and we don’t have to react negatively. What we have to understand here is that behind all great upheavals of civilisation the real hidden reason behind all these is that time is not constant and nothing is permanent here. Time is not linear but cyclic in nature, and like a graph there are always ups and downs in it. At one point of time Zoroastrian civilization is at peak at another point there is downfall. What we are talking here is time span stretching up to thousand and thousands of years and is not a History of few hundred years we witness in our life time. The end of one time life cycle meets the beginning of another time cycle. What we are talking here is called as “Hapt Rang e Zaman” or “Tavil e Zarvane Daregho khadat”. Our earth and humanity on it is exposed to seven planetary colours of Zodiac that governs the time and Era we live in. The present time that we live in is the one that comes out of our own past, which will be the future of our own next coming generation. All three are inter-related with one another, that is Past, Present and Future. Then what exactly is this Time made up of ?? “Time is a measured duration, the material of our being, and the index of our progression to Eternity”. ………………Reference:- Pg. 114 Firdausi Tusi Memorial Volume. Na az ranjo Timar Bogzaydash. Ne chu ma tabahi Pizard Hami. Translation:- Zamanah will keep on moving, revolving. And the Celestial Movement in the skies does not get tired or sad or old in its movement and its effects never cease to occur. The era or zamanah manifests as per movement of revolving skies. The movement of the skies is the cause, and its effect is the Zamanah we live in. The movement of skies keeps on moving ceaselessly on and on and it just does not die like us. Be nezdeh Vali O Nabi Gir Jaye. Chuninsta e rasmo rahe Mansta. Badeshan marah rahe goftar nisht. Firdausi Tusi says in his lines that “ If you desire to go to desirable place after your death, then make arrangements beforehand and try to go to place where Nabi and Ali dwells. If you, like me are unable to make such arrangements “Bad Ayad”, then just remember the fault is within me and due to my past deeds I am unable to go there. I am not at all concerned with others “Aba Digara” and I am not answerable for others and their deeds “marah kar nisht” . For I do not want to discuss, listen and believe in their fanatical Fatwas or Dos and Don’ts which are driven by superstitious believes. That is why we see history as so repetitive here, when we say as History repeats itself. Even a history of few hundred years is not correctly recorded here, owing to the bias of historians who are writing it. The Greeks and Romans have done so with our History . The reason for their Bias is due to their inevitable defeat on the hands of Persians who they tried to subjugate them with their entire might applied yet with failure. The classic example is the history that goes behind India’s Freedom struggle and how we achieved Independence from the British. What is the Irony of Indian Independence is that although we have achieved freedom from British we have become slaves to their habits and culture. The Hindus have forgotten their own ancient religion, what is said in Vedas and Gita, and have adopted the west and its ways of life. Same is case with every religion here. We Parsees also do not lag behind in not remembering the ancient teachings of our great religion. This is time of Kali-Yuga where all ignorance comes out. This is like a rat in hiding is exposed to materialistic tunes of the Pied Piper. This is nothing short of us falling into ancient trap of Satan which never fails to hit his target with precision. All Satan has to do is lure us into three trap of vices or “The Three Sirens”. The three Sirens are 1) Power, 2) Women 3) Wealth. After all Satan first works on our thoughts with temptations, so are we helpless ??. The answer is no which will be a relief to many of us. Just as we face problems, so do we have solution for it. As per our Deen the best way to tackle bad thoughts is to speak Truth to break ourselves free from the shackles of Bad thoughts. Druji Buji is prevailing everywhere in our surrounding artmosphere. We follow Meher Patet Traikat, keep our khoreh as much as pure this will set us apart and free us from the shackes. Never to have negative thoughts over our inability to follow Tarikats and continue with our Avesta Mathra. Cleanliness of our inner hidden thoughts – Batein Mithra will keep two third of our khoreh clean, the rest one third Khoreh we have to clean it with druj Parhej Traikats. Now let us touch topic of Fasal. Reference:- Firdausi Tusi Millenary Frashogard Memorial Volume Page 132-135. 1) Fasal is divine knowledge= Batein, and not worldly knowledge and is based on truths in nature. 3) Our Rituals, Prayers and Gahambars as per Bar wakhat ( right time in nature) is not based on weather. 4) Our Rituals, Prayers and Gahambars as per Bar wakhat ( right time in nature) are based on unseen currents of Fasal or “Fasal Khastar” . 5) Fasal are certain and constant. 6) Weather or “Rutu” is uncertain, erratic, and variable. 7) The machinery behind Fasal Is from Minoi world or Jirmani world which is known as Hasti Universe or Immortal world. 8) The reason behind Rutu or weather is Nisti or world which is not permanent and is also called as Arvahi or Jirmani world. 9) Fasal is based on Stoat Yasna. 10) Rutu or weather is based on 4 elements and its combinations with one another. The 4 elements are Fire, Air, water, and Earth. Zodiacs at certain time activate Fasal Currents beneficial for this earth. 13) The base of Fasal depends solely on Sun and its Movement. 14) The Rituals and prayers in our Zarathosti Deen and its effectiveness or results depends solely on Sun and its movement in the skies. 15) The currents of Fasal falling on any place on earth is of uniform nature and spread evenly on earth. Courtesy:- This Image is taken from Firdausi Tusi Millenary Frashogard Memorial Volume No. 24 Issue 1- 4. 17) Fasal has got no connection with English, Christian, Hindu, Islamic or Jewish Calendars. 18) Fasal is absolute independent rule governed by Sun moving in 12 Zodiac Signs. 19) As we are supposed to attune with Daena or inner consciousness of our Zarathusti Deen, similarly we are supposed to attune ourselves with Fasal currents and is known as “Ratu-Friti” and “Paiti-Frasao”. 20) The above mentioned names of 6 Gahambars are not any names of “Rutu” or weather, and whenever Fasal currents simultaneously manifest itself at right time in nature on this earth that is time when special Gahambar kriyas can and should be performed. That is what one means when we celebrate Gahambars. The feasting ceremony during Gahambars is only superficial way of celebrating and observing Gahambars. 21) As Mithra ( Thoughts), Mathra ( Spoken words), Yasna ( action, deeds), Asha ( Ashoi), Kharenagah ( Khoreh), Paityoget ( Keshash), Ahu ( Havarashta and Hukhta which is result of Hukhta) Note;- It is through Humata, Hukhata and Havarashta of Yazata that this Universe functions, Khetvodath ( Male and female parts merge and thus forms one whole unit of Ruvan), Stoat ( Various Chanels of Ahunavar working in Nature), Khastar ( There are 81 types of electricity in nature of which Electrical power we see is the most grossest in nature and at lowest level) are all basic and immutable laws of nature through which it functions. Similarly basic laws of Ratu ( Fasal) are exdplained in Ashat Nask ( Pehelvi Pajeh). In other two Nasks namely Dadat Nask ( Pehelvi Hadokht Nask) and Aa Nask ( Pehelvi Husparam Nask) contains details of Fasal and Gahambar. The Pehlevi Dinkard book translated by Late Peshotan Sanjana is analysis of 21 Nasks, and the above explanation of Fasal and Gahamabar can be found in Volume No 8 of Dinkard. But it is just an Analysis whereas actual Tavil can be found from Khshnoomic literature. 22) Just as to understand what is Ashoi one has to actually observe physical purity rules and by observing it meticulously one can understand it later. Similarly the inner Mystic details of Fasal and its real purpose in nature can be understood only if it has been put into actual practice or Amal.From Pahalvi Hadokht Nask itself old Avesta references which are lost can be found luckily in our present extant Pazand prayers of Afrin e Gahambar. 23) High degree of Ashoi is required for one to perform Amal of Fasal and which can be done by none other than an Ashwan of 6 Kash only and not by us. 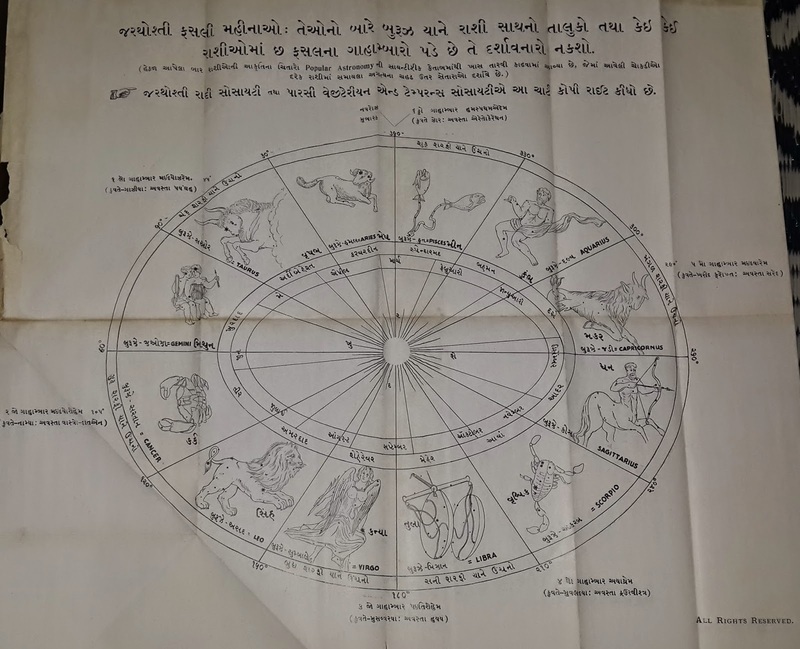 One has to take into consideration the connection between 12 months of our Zarathosti deen from Fravardin Mah to Aspandard Mah and its connections with 12 Zodiac signs of 4 various Zodiac constellations known as Bhachakra. 24) Just as meaning of “Aap” does not limit oneself to waters of well, sea, rain or lakes that we see and that which can quench our thirst, similarly the Atash does not mean the heat producing fire that can ignite the wood, similarly the word “Asp” does not merely mean horse, and so is the case with Gav, which does not merely mean four legged Gospand. Similarly Ratu or Fasal does not merely mean Rutu or Seasons. 25) The source of Fasal and its currents come right from 8th Asman of “Anagra-Raocha” which is even above the 7 eternal Hasti Asmans and it means skies of endless shining lights filled with sparking Stars. Khordad Amesaspand and its jurisdiction is prevailing on 8th Asman who is specially allotted the portfolio of Time just as a minister is allotted a portfolio by Prime Minister, but over here P.M. is dadar Ahura Mazda himself who is himself working in different way as Khordad Ameshpand working on “fasal” currents and “Ratu” so very much essential for upkeep of this Universe. 26) Dinkard, Bundaheshneh, and Afrin E Gahambar has to be studied properly to reach to a logical conclusion. 27) Yaerya and Sared Yazad are two co-workers of Khordad Amesaspand who work on principles of Mazdadat and Ahura Daat as explained in Madayasni Zarathosti deen. 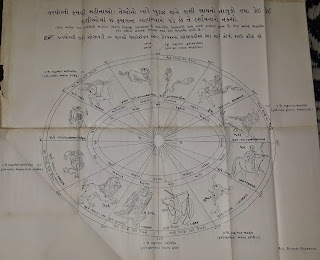 28) In first sign of Aries when Sun arrives on or around 21st March every year as per Sayana Astrology or on 13th April as per Niryana Astrology of Hindus has to be properly understood. “Aspinacha Yavino” as in haptan yasht has to be understood properly. Note:- Yaerya Yazad brings down the Fasal currents on this earth which brings Niyamat , Rutu or seasons and western Ephemeris of Sayana or western Astrology is consulted.Where as Sared yazad brings down Bago Bakht currents down on earth – Keshash of every individual man is brought down and Hindu Panchagna is consulted. There were/are many Scholars who felt and feel even today that the best calendar is Fasal and not the present Calendar of Hushmordi Shahenshahi Calendar which we are following today. My effort will be in the direction to prove how wrong those scholars of the past were in coming to that conclusion, and by taking help of Dr Saheb F.S. Chiniwala’s and Jehangirji Chiniwala’s writings. Hey you have written nice blog with very huge descriptive nice one and your blog title is also interesting.